Brad and Brittany met while serving as "wingman" and "wing woman" for a couple of their friends on a cold Saturday night in Raleigh. NC. Brittany noticed that Brad had ordered a beer at the liquor bar they were at, and began calling his choice into question. Brad changed his order from beer to whiskey, and the two instantly clicked. On one July 4th a couple years back, Brad decided it was time to pop the question. The couple were spending the weekend at Brittany's parents' lakeside property in Smith Mountain Lake. At dusk, Brad invited Brittany for a walk with their golden retriever, Milo. While they were walking, Brad somewhat awkwardly got down on one knee to pet Milo, but instead turned to Brittany and proposed. The moment was perfect, until Milo spotted a dear in the distance and took off after it. It was a touching and hilarious evening filled with tears of joy, buck-wild dog corralling, and a celebration with Brittany's family. When it came down to the wedding, both Brittany and Brad decided to make family and friends a huge part of the ceremony. Wedding photos of relatives donned every table, and each table number was the year that particular couple was married. Brittany and Brad were even able to borrow a vintage 1947 Rolls Royce Silver Wraith from some family friends. This gorgeous and rare car was used as a prop for wedding photos and as transport for the couple as they rolled down the tree-lined drive of the mansion after the wedding. Brittany's favorite part of the evening was being able to share it with her loved ones. She described walking down the aisle with her father as a "once-in-a-lifetime" moment, and she was moved to tears during his speech at the reception. Brittany's sisters also gave incredible, heartfelt speeches in honor of the bride and groom. To thank all their wonderful guests, Brittany and Brad gave out "Welcome Boxes" that included Virginia peanuts, Amish-baked woopie pies, and a personal thank-you note. They also provided a full bathroom-bar at the reception restrooms and made sure all guests had plenty of drinks and snacks waiting for them back at their hotel. The Berry Hill Mansion did not require many lavish decorations, considering its original charm. 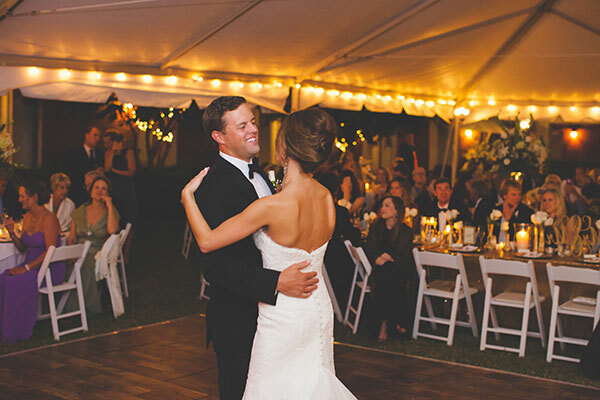 Brittany and Brad chose a black and white monogram theme to celebrate their new monogram. The black and white colors matched the bridesmaids and groomsmen and worked well with the Berry Hill Mansion's classic white façade. The new monogram was used on the mansion doors, on corn hole boards, and even as a cake topper. 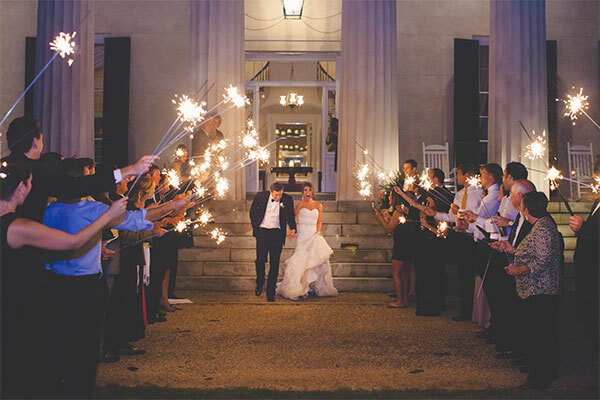 The couple's choice of venue ended up being the perfect way to bring family and friends together for a full weekend celebration, starting off with a Friday night welcome dinner on the grounds and ending with a Sunday brunch buffet. Be sure to see the Pomeroy wedding on page 98 of the third issue of bridebook! Attendant's Dresses: After Six from Wedding Shoppe Inc.